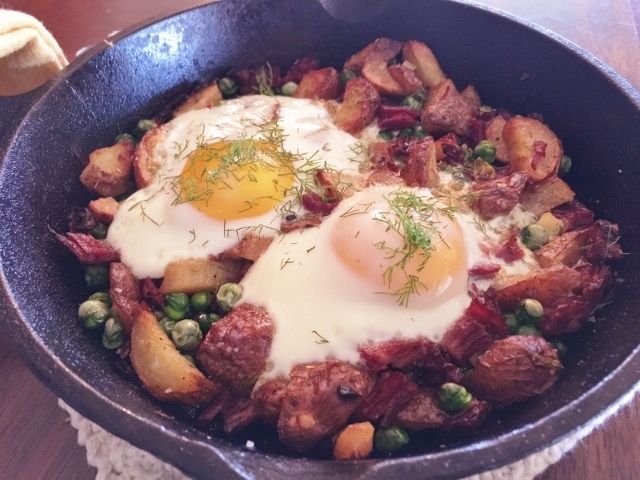 Corned Beef Hash & Sunny Side Eggs - Recipe! - Live. Love. Laugh. Food. If you are like me, I still have a little corned beef leftover from St. Patrick’s Day. I have already done the typical leftovers, like corned beef sandwiches, adding a little meat to salads or just eating it plain as a snack. 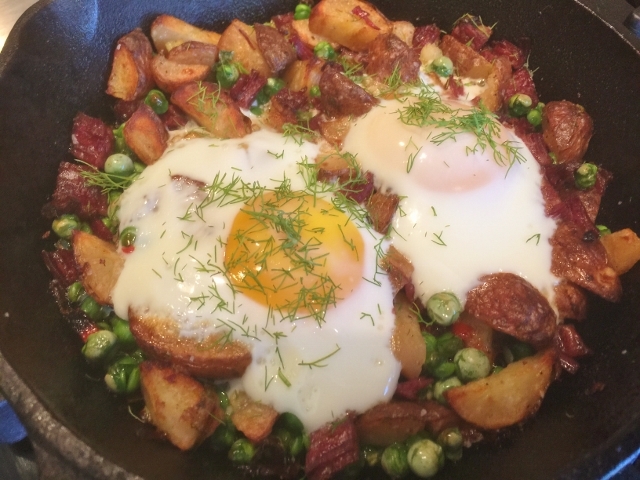 Also, I have some leftover roasted potatoes from my recipe, Slow Cooker Corned Beef with Roasted Cabbage & Potatoes, so I decided to create a seasonal egg dish with fresh ingredients for a Corned Beef Hash & Sunny Side Eggs Recipe. Eggs can be eaten any time of day – breakfast, lunch or dinner. 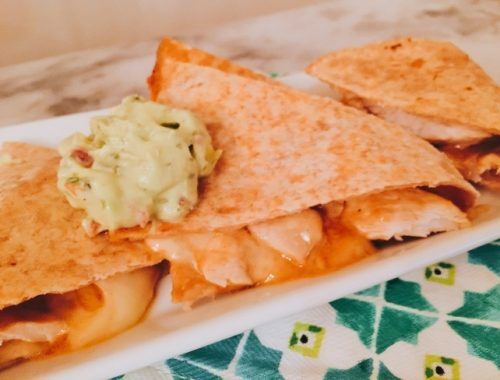 My husband is a huge egg lover, so I tend to make them for him on weekends, but why not prepare them for a quick weeknight meal? 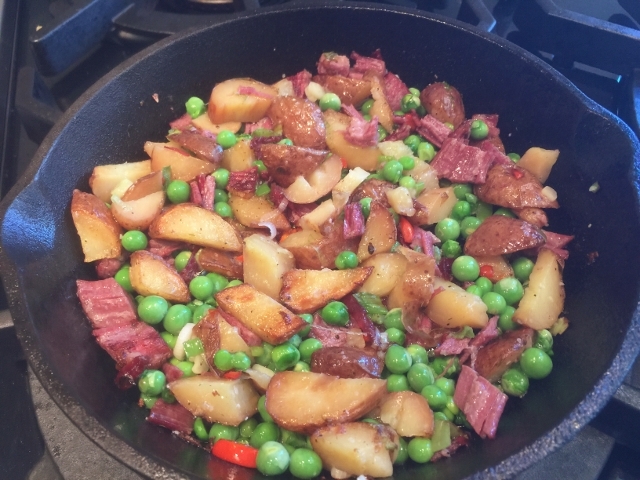 The combination of sauteed corned beef with potatoes and a few fresh ingredients, like fresh peas and scallions, make this a delicious anytime meal. 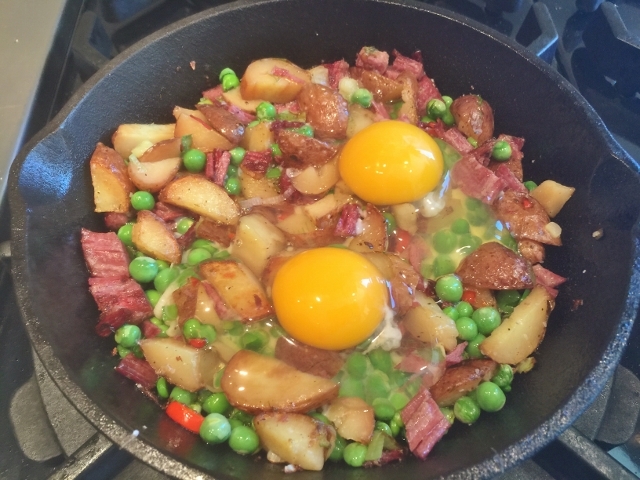 I prepared the corned beef and potatoes on the stovetop and then cracked the eggs on top and placed the pan under the broiler for a few minutes to finish. 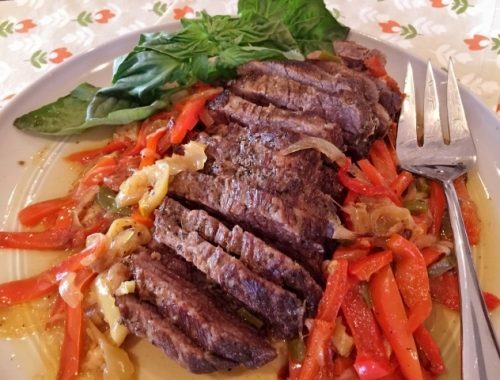 I think it tastes great with sunny side eggs, but you can cook them longer for hard, or even scramble them in another pan and place them on top. 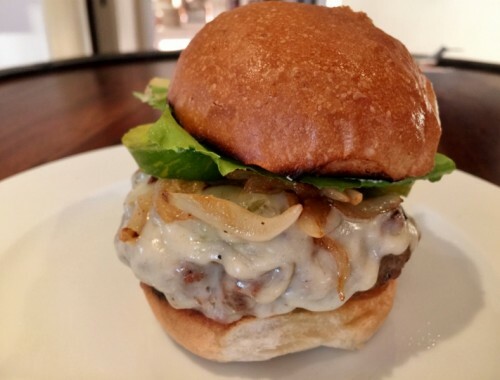 To finish, I added a sprinkling of fresh dill to heighten the flavors. This dish is also great for brunch – think Easter Sunday! 1. 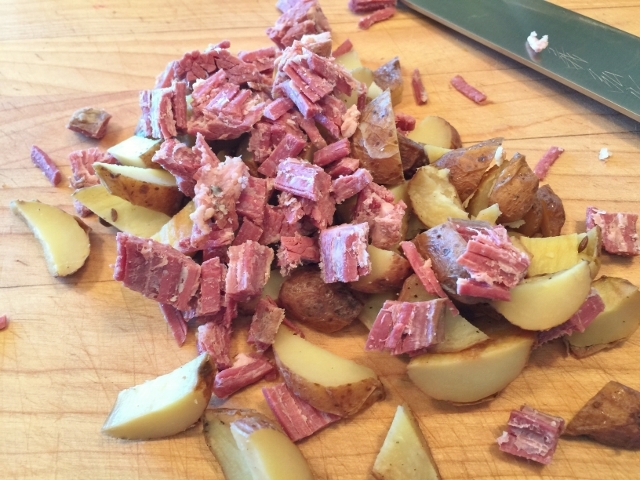 Preheat broiler and chop corned beef and dice up the roasted potatoes. 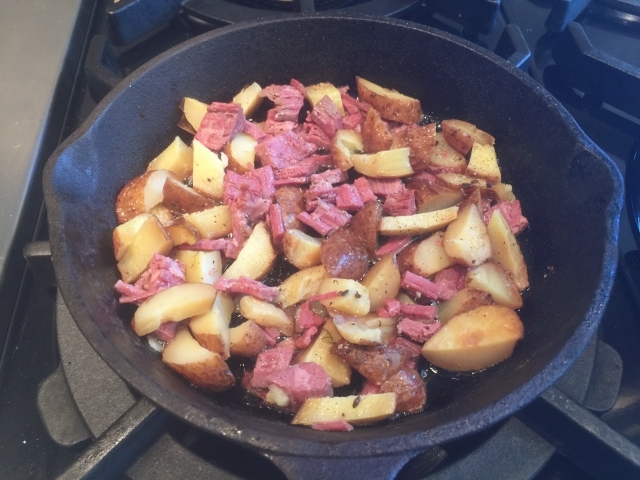 If you don’t have roasted potatoes, you can use fresh potatoes and cook them first in the pan before you add the corned beef. In an iron skillet, add 1 tablespoon of olive olive and place it over medium heat. 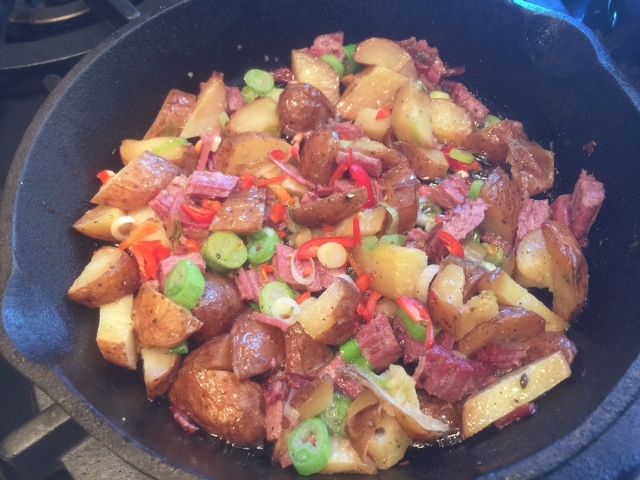 Place corned beef and potatoes in pan and stir occasionally to warm, about 2 minutes. 2. Then, add scallions and jalapenos and stir to combine. If you like some heat, leave the seeds in jalapeno, if not, remove them. Continue to cook corned beef mixture, stirring occasionally. 3. Next, add peas and stir to combine. Sprinkle entire dish with a couple pinches of salt and pepper. Let mixture continue to cook over medium heat for 4 minutes, or until peas are slightly softened. 4. Gently crack eggs over top of hash. 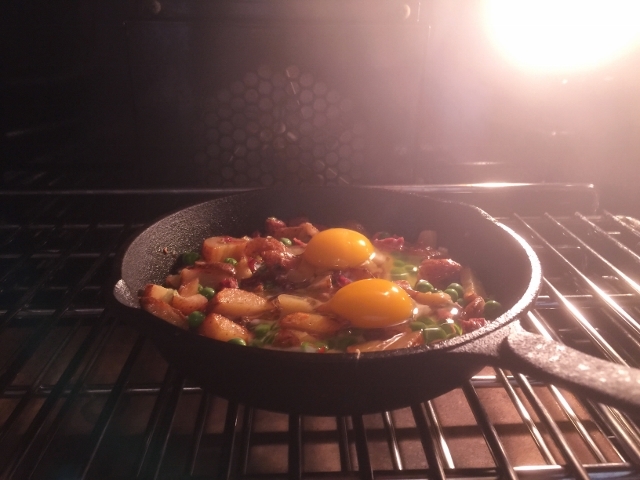 Place pan in oven under broiler for 3-5 minutes, depending upon how you like your eggs. Check eggs after 2 minutes. 5. Remove pan from oven and sprinkle with fresh dill, with a drizzle of olive oil. Serve in skillet family style or spoon onto individual plates. Enjoy! 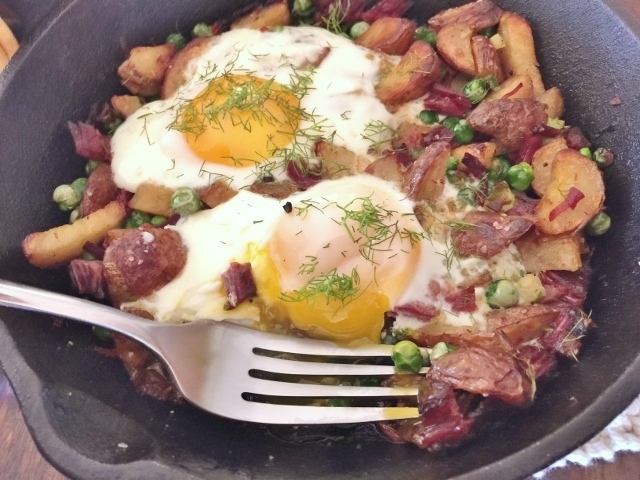 Brunch Recipescooking with Gena BellCorned Beef & Hash RecipeEaster Brunch RecipesGreat Leftover RecipesHow to Make Corned Beef & HashSpringtime Corned Beef Hash & Sunny Side Eggs - Recipe! Slow-Cooker Italian Brisket with Sweet & Spicy Peppers – Recipe!